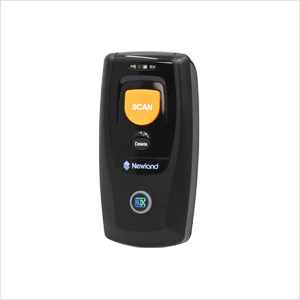 Armed with Newland’s NLDC technology, the scanner can read 1D & 2D barcodes printed on paper or displayed on a screen with ease. Along with Bluetooth 4.0 low energy support, the high capacity Li-ion battery in the scanner provides up to 12 hours of continuous use per charge. The NLS-BS8060 sports stylish looks, a compact size and foolproof operation with merely three buttons requiring virtually no training. The NLS-BS80 equipped with Bluetooth 4.0 Class 1 technology enjoys enhanced data rate, five times faster than regular Bluetooth. Supporting both iOS and Android operating systems, the NLS-BS8060 outperforms its competitors at compatibility. This rugged IP42-sealed barcode scanner can withstand multiple 1.2m drops to concrete. O2O applications: Barcode-enabled mobile payments, e-coupons/e-vouchers, etc. Traditional applications: Store visits, retail store management, mobile clinics, distributor management, etc. Symbologies 1D: Code 128, EAN-13, EAN-8, Code 39, UPC-A, UPC-E, Codabar, ISSN, Interleaved 2 of 5, ISBN, Code 93, UCC/EAN-128, GS1 Databar, etc. 2D: PDF417, QR Code, Data Matrix, etc. 1D: Code 128, EAN-13, EAN-8, Code 39, UPC-A, UPC-E, Codabar, ISSN, Interleaved 2 of 5, ISBN, Code 93, UCC/EAN-128, GS1 Databar, etc.